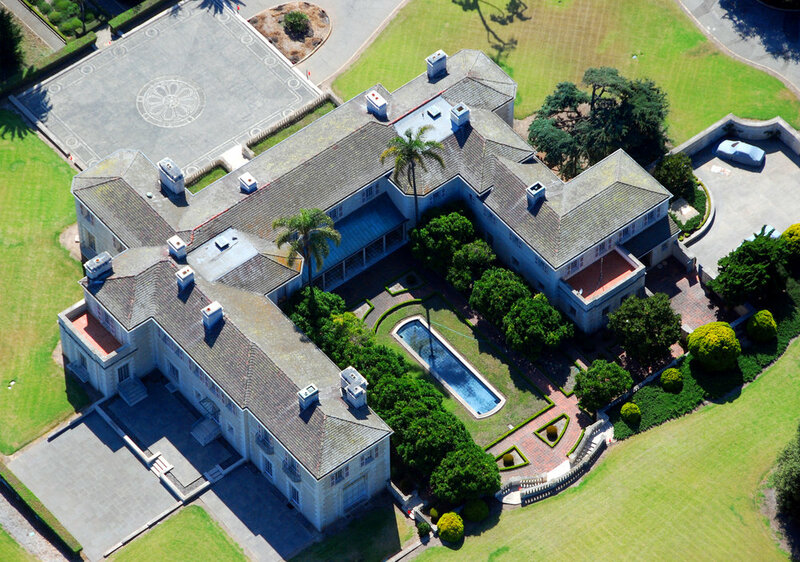 Breaking news in the Huguette Clark world: The Bellosguardo Foundation, which is managing the oceanfront estate in Santa Barbara of the reclusive copper heiress from our book Empty Mansions, has created a website and announced an inaugural event on October 13. Individual tickets go on sale on August 15, or you can donate $1,500 up to $50,000 to be assured of attending. The website announces "the first celebration to take place on the property in over 60 years. Now that the administration of Mrs. Clark's estate is complete, it is time to begin the next chapter in the story of this extraordinary property. To celebrate, our Event Committee is busy creating an elegant, Gatsbyesque soiree, showcasing both the estate's history and its potential. Santa Barbara has indeed been blessed with the gift of this historic, twenty-four acre, oceanfront property. Few estates match its majesty, beauty and fascinating history. The Foundation looks to honor Clark's legacy and ensure that Bellosguardo becomes a focal point for arts and culture for generations to come. This event will raise much needed funds so that we may continue to maintain the house, grounds and collections, as we move forward with our larger vision and open the property to the public. We hope to see you at what will be a magnificent evening of cocktails and bountiful hors d'oeuvres under the stars, as we celebrate this glorious estate in all its 1920s splendor.... Huguette has bequeathed the property to the Bellosguardo Foundation, which is committed to both honoring the Clarks' past, and building a future where the estate can be enjoyed by all as a focal point for the arts. Realizing that future will take time and commitment, but the fruits of that labor will be well worth the effort." Here's the new website for the Bellosguardo Foundation. An update on the Bellosguardo Foundation comes to us from Noozhawk, the publication in Santa Barbara: After 3 Years, Bellosguardo Estate in Santa Barbara Still in IRS Limbo. Only $2.99. Here's a price break on the No. 1 bestselling biography of reclusive heiress Huguette Clark. 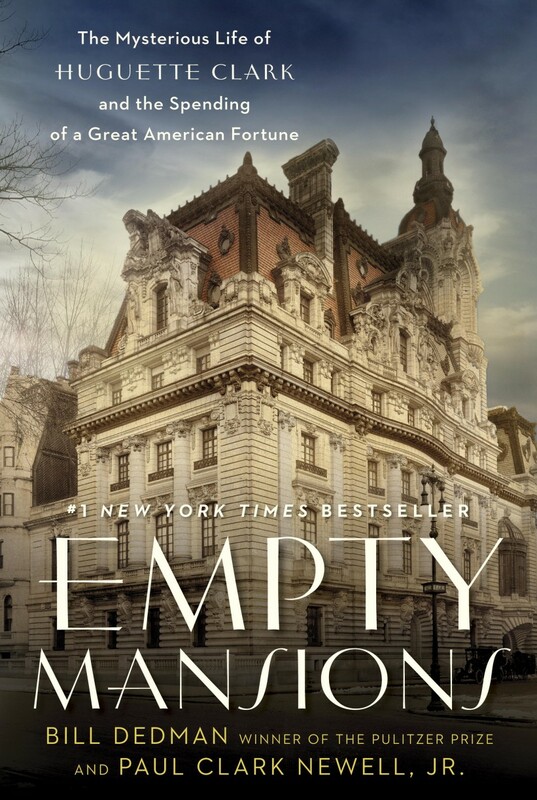 For the next 10 days, Random House has reduced the price of the e-book of Empty Mansions to only $2.99. Same low price on the Amazon Kindle, on the Nook from Barnes & Noble, on iTunes, etc. Includes 75 photos and all updates on the estate trial. Paul Clark Newell, Jr., co-author of the No. 1 New York Times bestselling biography Empty Mansions, died on Wednesday, September 14, at a hospital in Escondido, California, with his siblings and daughter by his side. Newell celebrated his 80th birthday in January with family and friends. Newell's book, Empty Mansions: The Mysterious Life of Huguette Clark and the Spending of a Great American Fortune, written with journalist Bill Dedman, debuted at No. 1 on the New York Times best sellers list in September 2013. It remained on the Times list for 13 weeks, and The Los Angeles Times list for 37 weeks. Statement from Bill Dedman: "Paul was a gracious, gentlemanly, and brilliant co-pilot. I had the great pleasure of working with Paul for the past few years on the story of his cousin Huguette Clark and her family. When we began collaborating, my journalist friends warned, don't write a book with a family member!, as they presumed he would want to shape the story to protect the reputations of his famous relatives. But Paul was focused on making sure that we told the story accurately and fairly. And that was the right approach. On the day Paul died, I received a copy of our book published in Mandarin, and I will pass that on to Paul's family. He was a dear man." Newell's father had collected family history, particularly on his uncle, the late U.S. Sen. William Andrews Clark of Montana (1839-1925), the controversial copper millionaire, banker, and politician, who founded the city of Las Vegas as a stop on his railroad. After Paul Newell Sr. died, his son took up the baton, working for 20 years on a biography of his great uncle. After the senator's daughter, Huguette (1906-2011), became famous again in this century because of her reclusive ways and a battle over her fortune, Newell and Dedman began to work together on a biography of Huguette and her famous father. Newell's conversations with his cousin Huguette, their correspondence, and his collection of family photographs and other research, were essential to the biography. Newell shared many conversations over nine years with Huguette about her life and family. Excerpts of those conversations, about 30 minutes of tape recordings, can be heard in the audio version of Empty Mansions. Newell received on Huguette's orders a rare private tour of Bellosguardo, her mysterious unused estate overlooking the Pacific Ocean in Santa Barbara, California. Newell was not one of the relatives who sought to inherit the $300 million fortune of the reclusive Huguette; as a cousin, not a nephew, he was not in line for an inheritance if her last will and testament was overturned. Paul Clark Newell, Jr., was a 1958 graduate of Occidental College in Los Angeles. After several executive roles in corporations, including Mattel, Newell worked as a real estate agent in Warner Springs, California, in the mountains outside of San Diego. Survivors include his daughter, Leslie Newell Spangler, and her husband, Brad; their children, Eric and Jessalyn; his brother, Peter; his sister, Eve; his great-grandson, Edan; and grandnieces and grandnephews. A memorial service will be planned. Here is a link to a feature on Newell in the Occidental magazine: http://www.oxy.edu/magazine/fall-2013/mixed-media. More information on Empty Mansions is at http://emptymansionsbook.com/. Photos of Newell are at https://www.facebook.com/investigative.reporter. What will Chinese readers think of Huguette Clark and her empty mansions? The Chinese edition of EMPTY MANSIONS will soon be out. Here are the covers, front and back, from China Renmin University Press and Mind Times Press. In addition to this edition in Mandarin, EMPTY MANSIONS has been published in translation in Italy and Brazil, and in English in the United Kingdom, Commonwealth, the USA, and Canada. Five members of the inner circle of the reclusive copper heiress Huguette Clark speak out in 25 video excerpts of sworn testimony, newly available on the website of the No. 1 bestselling biography "Empty Mansions: The Mysterious Life of Huguette Clark and the Spending of a Great American Fortune." The five — Huguette's nurse, personal assistant, goddaughter, attorney, and accountant — testified in videotaped depositions as part of the court battle over her $300 million estate. Although portions of their testimony appeared in "Empty Mansions," this is the first time the video excerpts and full transcripts have been available to the public. The nurse, Hadassah Peri, who served as a private-duty nurse for Huguette in the hospital for twenty years, and received from Huguette $31 million in gifts while Huguette lived. In the settlement of the Clark estate, Peri agreed to pay back $5 million to the estate, and gave up rights to millions more that Huguette had left her in her will. In her testimony, Peri describes how Huguette came to give her a Stradivarius violin, how they passed the time for 20 years in the hospital, how she objected when Huguette wanted to give her a painting by Cezanne, She also reflects on Huguette's character and temperament. Peri cautions the attorneys at the table never to buy a Bentley, as she did. And we listen to a telephone conversation between Peri and Huguette when the heiress was 101 years old. The personal assistant, Chris Sattler, who took care of her three Manhattan apartments, fine paintings, and vast doll collection. Sattler explains his duties taking care of the dolls. He laments that people get the wrong impression of Huguette because she loved dolls and cartoons. He said Huguette kept buying dolls at auction, because she loved the bidding, but had so many dolls that she started to give them away. Sattler describes Huguette's reactions as he would attempt to follow her instructions for setting up scenes of tiny Japanese dolls. The goddaughter, Wanda Styka, daughter of Huguette's painting instructor Tadé Styka. Wanda Styka wrote kind letters to Huguette for decades, and received a bequest worth millions. Styka describes how Huguette kept from her the fact that she was living in a hospital, and how the goddaughter didn't press for more information, respecting her godmother's privacy. Styka tells how her godmother Huguette warned her never to live alone. And she describes their last telephone conversation, in which Huguette, born in 1906, recalls World War I, World War II, and the passing years. The attorney, Wallace "Wally" Bock, who handled her legal affairs for years, although he met her only a few times in the hospital. The attorney describes his fears that Huguette was a soft touch for a sad story whenever the nurses and other would have a financial need or want. But Bock describes Huguette as an astute woman who gave gifts to people because she wanted to see them receive them. Bock said it was Huguette's choice to live in the hospital, and rejects a characterization of her as "like a spoiled child," calling her a strong-willed woman who did what she wanted. The accountant, Irving Kamsler, who handled her finances and was her health care proxy. In the settlement, the attorney and accountant gave up rights to bequests, fees as her executors, and roles as trustees. A well-publicized criminal investigation of their handling of the estate was closed quietly without charges. Kamsler says Huguette told him that she wanted none of her $300 million copper-mining inheritance to go to her family. He describes conversations in which he tried to slow down Huguette's gift giving, because of the difficulties in raising cash to pay all the gift taxes. In these video excerpts, the witnesses offer glimpses of the character of Huguette, whom they describe as a lovely person, respectful, soft-spoken, concerned for others. Their testimony is largely a defense against the claim of her relatives that Huguette Clark was incompetent, and that she was unduly influenced by her nurse and attorney and accountant. In addition to these video excerpts, you can read the full testimony by each of these five witnesses. Only a few phrases have been redacted from the transcripts to protect privacy, such as when a witness gives a home address or telephone number or refers to a relative's illness. See the videos and read the testimony. Signed first printings of "Empty Mansions" are for sale on AbeBooks. The first printing was quite small, but a bookseller in California has books signed by both authors. See the listing at AbeBooks. (Look down that page under catalogs for "EXCLUSIVE ~ Empty Mansions ~ FIRST PRINTING ~ SIGNED X 2." Ballantine Books went back to press today for 5,000 more paperback copies of the bestselling book Empty Mansions: The Mysterious Life of Huguette Clark and the Spending of a Great American Fortune. Updates on the settlement of the estate of heiress Huguette Clark are in all copies of the paperback book and all printings beginning with the thirteenth printing of the hardcover book. Electronic copies (Nook and Kindle) should also have the updates. Did you buy one of the paintings by Huguette Clark? There's an effort to put together an exhibit of paintings by Huguette Clark. If you bought one of her works at the Christie's auction in 2014, or otherwise have one of Huguette's paintings, please drop an email, in confidence, to Bill Dedman. Ballantine Books went back to press today for 7,500 more paperback copies of the bestselling book Empty Mansions: The Mysterious Life of Huguette Clark and the Spending of a Great American Fortune. Both the hardcover and paperback editions have the latest updates on the estate of heiress Huguette Clark. The Bellosguardo Foundation, which will inherit Huguette Clark's $85 million oceanfront property in Santa Barbara, has been incorporated in New York as a nonprofit. The president of the foundation is Jeremy Lindaman, the political consultant to Santa Barbara Mayor Helene Schneider. Here's a link to the incorporation listing in New York. The mayor recently nominated the first board of directors for the foundation; members are then approved by the attorney general of the state of New York, also as agreed in the settlement. (So it's a New York charity with its only asset in California.) FYI, the list of directors is in this previous post. The settlement agreement named three ex officio members: a representative of the Clark relatives, a representative of the Corcoran Gallery of Art, and a representative of Huguette's longtime attorney in Santa Barbara. Ten free copies of the "Empty Mansions" paperback edition, signed by the authors, are available through Goodreads. Sign up for the drawing at Goodreads. Entries close on Dec. 10, 2014. The trustees were announced today for the Bellosguardo Foundation, which will oversee Huguette Clark's summer home in Santa Barbara, California. See the list below. The legal settlement of the Clark estate called for one board member to come from the Clark relatives who challenged Huguette's will, and one from the Corcoran Gallery of Art in Washington, and one from her attorney in Santa Barbara, Jim Hurley. The rest of the trustees are nominated by the mayor of Santa Barbara. All are approved by the New York attorney general. After a little over one year of working with the New York Public Administrator’s office and the N.Y. Attorney General’s Charitable Division Bureau, the process of creating a new Bellosguardo Foundation under the late Huguette Clark’s settlement agreement has been completed. As per the settlement agreement, the Foundation Board of Directors consists of three named individuals and seven others nominated by Santa Barbara Mayor Helene Schneider. As part of the process, the Mayor, Public Administrator and the Board agreed that the Foundation would best be served by seating a total of 19 individuals to the initial Board of Directors. -- Peter Jordano: President/CEO Jordano’s Inc. This Foundation will oversee Mrs. Clark’s Santa Barbara Bellosguardo property once probate is completed in New York State. At that time, this Foundation will also take possession of Bellosguardo’s furnishings and artwork, and Mrs. Clark’s extensive doll collection. Negotiations between the Internal Revenue Service and the Estate’s Executors are ongoing, and are estimated to take another 12-18 months. During this transition, the Estate will continue to provide management of the Bellosguardo property. Would you like Empty Mansions postcards to distribute? To fans of "Empty Mansions" and the Huguette Clark story: We've printed little postcards to promote the book and to let people know about our website and the upcoming feature film. We'd like your help handing out the cards to friends you think would like to know about the Clark story and the book. If you'd like to hand out the cards to a group, or at your public library, or wherever seems appropriate to you, just send a note to Bill Dedman with your mailing address and the number of the 5x7 cards that you'd like. Send an email to Bill@EmptyMansionsBook.com. The cards are only 8 cents apiece, so ask for as many as you can use. Thanks to everyone for your encouragement and help all the way through this project. Send the books to Bill Dedman, 1771 Post Road East, #125, Westport, CT 06880. Bill will sign your books, and send them to Paul, who will sign and send them back to you. Include cash or check or money order to Bill Dedman for U.S. Postal Service media mail: The hardcover books are 2 pounds each, so the rates to ship them (twice) are $6.34 for one book, $8.26 for two books, $10.18 for three books, $12.06 for four books, and $13.90 for five books. Melville, NY, September 15, 2014 – Newsday announced today that Pulitzer Prize-winning investigative reporter Bill Dedman will join the publication this month. Dedman arrives at Newsday after eight years with NBCNews.com, where his stories appeared on both the website and NBC television. Dedman received the 1989 Pulitzer Prize in investigative reporting for “The Color of Money,” a series of articles in The Atlanta Journal-Constitution on racial discrimination by mortgage lenders in middle-income neighborhoods. In 2008, his reporting on firefighter deaths was recognized with a national award by the Society of Professional Journalists. Dedman also received a 2011 Best in Business award from the Society of American Business Editors and Writers for his work on reclusive heiress Huguette Clark and her family, which became one of NBCNews.com’s most popular features. Dedman co-wrote “Empty Mansions: The Mysterious Life of Huguette Clark and the Spending of a Great American Fortune,” which hit No. 1 on The New York Times bestseller list and was named a best book of 2013 by Amazon.com, Barnes & Noble, and Goodreads, among others. "I'm thrilled to be joining the talented and dedicated team of journalists at Newsday. Newsday is one of the few news organizations to put more resources behind world-class investigative reporting, news coverage you can trust, and telling great stories. This newsroom has big ambitions and a passion for journalism that matters," Dedman said. “Bill is an engaging writer whose skills as a journalist for print, online and video will help us continue to build on the strong enterprise work we’re doing at Newsday,” said Deborah Henley, Editor of Newsday. While at NBCNews.com, Dedman disclosed flaws in the Pentagon’s efforts to identify servicemen and women lost in past wars; fatal problems with firefighter safety equipment; uninspected highway bridges; coercive interrogation of detainees at Guantanamo; and strategies for discouraging school shootings. Dedman’s journalism career began at the age of 16 as a copy boy at The Chattanooga Times. He then went on to report for The Washington Post, The New York Times and The Boston Globe, and was the first director of computer-assisted reporting for the Associated Press. He has taught advanced reporting at the University of Maryland, Northwestern University and Boston University. He served for six years as a member of the board of directors of Investigative Reporters and Editors, a nonprofit educational association. Newsday Media Group includes Newsday, one of the nation’s largest daily newspapers, serving Long Island through its portfolio of print, live event, mobile and digital products, including Newsday.com. With 19 Pulitzer Prizes and other esteemed awards for outstanding journalism, Newsday is read by six out of 10 Long Island adults each week. Other Newsday Media Group properties include exploreLI, the region’s most extensive print and digital activity/event listing; amNewYork, New York City’s most widely circulated free daily, and its website amNY.com; Newsday Connect, the digital solutions company serving Long Island business owners; and Newsday Local Publishing, one of the Northeast's largest groups of weekly shopper publications. Newsday Media Group is owned by Cablevision Systems Corporation. Shouldn't information in journalism and nonfiction be verifiable? Shouldn't information in journalism and nonfiction be verifiable? Let's keep made-up dialogue and internal monologues on the fiction shelf. Here's a blog post discussing that question, for the UK publication of "Empty Mansions: The Mysterious Life of Huguette Clark and the Spending of a Great American Fortune," from Atlantic Books. Read more at http://atlantic-books.co.uk/content/empty-mansions-bill-dedman-and-paul-clark-newell-jr. Readers in Arizona: We've added a second event in Phoenix on Monday, September 22. Before the evening talk at the Cronkite Journalism School at ASU's downtown Phoenix campus, Bill Dedman will speak and sign copies of "Empty Mansions" at Changing Hands bookstore's new Phoenix store. This will be a bit more than a book talk, with a mini-workshop on researching and telling your family's story. Details at https://emptymansions.squarespace.com/events/. One of the relatives who challenged the will of reclusive heiress Huguette Clark has died a couple of million dollars richer. Although he lived directly across Central Park from Huguette, Lewis told the court he "does not recall having attempted to communicate with Mrs. Clark at any time."